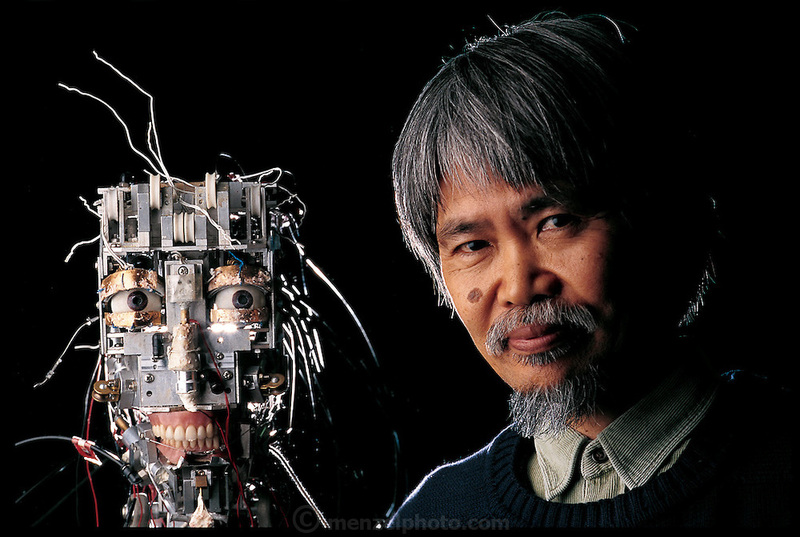 After he removes its skin, Fumio Hara gets the once-over from a face robot in the lab he co-directs with Hiroshi Kobayashi at the Science University of Tokyo, Japan. The first of several face robots made in his lab, it has a CCD camera in its left eye that sends images to neural-network software that recognizes faces and their expressions. Calling upon its repertoire of programmed reactions, it activates the motors and pulleys beneath its flexible skin to produce facial expressions of its own. The project is relatively unusual in its focus, many researchers believe that making robots walk and manipulate objects is so difficult that facial expressions are not yet worth working on. Hara disagrees, arguing that robots with animated faces will communicate with humans much more easily. From the book Robo sapiens: Evolution of a New Species, page 74-75.